On viXra log we have been having some lengthy discussions on energy conservation in classical general relativity. I have been trying to convince people that Energy is conserved, but most of them who have expressed an opinion think that energy is not conserved, or that the law of conservation of energy is somehow trivial in general relativity with no useful physical content. I am going to have one more try to show why energy is conserved and is not trivial by tackling the question of energy conservation in cosmology. Some physicists have claimed that energy conservation is violated when you look at the cosmic background radiation. This radiation consists of photons that are redshifted as the universe expands. The total number of photons remains constant but their individual energy decreases because it is proportional to their frequency ( E = hf ) and the frequency decreases due to redshift. This implies that the total energy in the radiation field decreases, but if energy is conserved, where does it go? The answer is that it goes into the gravitational field, but to make this answer convincing we need some equations. If the radiation question is not strong enough, what about the case of the cosmological constant, also known as dark energy? With modern precision cosmological observation it is now known that the cosmological constant is not zero and that dark energy contributes about 70% of the total non-gravitational energy content of the observable universe at the current cosmological epoch. (We assume here a standard cosmological model in which the dark energy is a fixed constant and not a dynamic field.) As the universe expands, the density of dark energy stays constant. This means that in an expanding region of space the total dark energy must be increasing. If energy is conserved, where is this energy coming from? Again the answer is that it comes from the gravitational field, but we need to look at the equations. These are questions that surfaced relatively recently. As I mentioned in my history post, the original dispute over energy conservation in general relativity began between Klein, Hilbert and Einstein in about 1916. It was finally settled by about 1957 after the work of Landau, Lifshitz, Bondi, Wheeler and others who sided with Einstein. After that it was mostly discussed only among science historians and philosophers. However, the discovery of cosmic microwave background and then dark energy have brought the discussion back, with some physicists once again doubting that the law of energy conservation can be correct. Energy in the real universe has contributions from all physical fields and radiation including gravity and dark energy. It is constantly changing from one form to another, it also flows from one place to another. It can travel in the form of radiation such as light or gravitational waves. Even the energy loss of binary pulsars in the form of gravitational waves has been observed indirectly and it agrees with experiment. None of these processes is trivial and energy is conserved in all cases. But what about energy on a truely universal scale, how does that work? The first term is the mass-energy from cold matter, (including dark matter) at density . The second term is the energy density from radiation. The third term is dark matter energy density and the last term is the energy in the gravitational field. Notice that the gravitational energy is negative. By the field equations we know that the value of the energy will be zero. This equation is in fact one of the Freidmann equations that is used in standard cosmology. It should now be clear how energy manages to be conserved in cosmology on large scales even with a cosmological constant. The dark energy in an expanding region increases with the volume of the region that contains it, but at the same time the expansion of space accelerates exponentially so that the negative contribution from the gravitational field also increases in magnitude rapidly. The total value of energy in an expanding region remains zero, and therefore constant. This is not a trivial result because it is equivalent to the Friedmann equation that captures the dynamics of the expanding universe. It is not very complicated or mysterious, and it’s not trivial because it describes gravtational dynamics on the scale of the observable universe. is the universal expansion factor as a funcrtion of time normalised to 1 at the current epoch. is a gravitational coupling constant. We have been discussion the law of conservation of energy in the context of classical general relativity. So far I have not been able to convince anyone here that the maths shows that energy is conserved. Lubos Motl and Matti Pitkanen have posted some contrary arguments on their blogs to add to the old one by Sean Carroll. We have also been trading points and counterpoint in the comments with Ervin Goldfain joining in, also in disagreement with me. To avoid going over the same arguments repeatedly we have agreed to disagree, for now. If you think such a discussion about Energy in physics seems off the wall, think again. This subject and related issues concerning gravitational waves have occupied physicists for years. Some well-known names in the world of science have exchanged some heated words and still not everyone agrees on the outcome. But it is too soon to end our debate. There are still a few more points I want to make. It was said that my claim in favour of energy conservation means that I am “convinced that all relativists are wrong”. This is not the case. Historically many relativists have been on my side. This is actually a debate that began as soon as general relativity was formulated by Einstein. Einstein in fact developed the first complete formulation of energy conservation in GR, but Hilbert objected. The argument has raged ever since with as many different views on the subject as there have been relativists and cosmologists. Amongst those who have accepted the law of energy conservation and produced their own formulations are Dirac, Landau, Wald, Weinberg and of course Einstein himself, so to say I am contradicting all relativists is far from true. It has also been said that all the textbooks show that energy is not conserved in general relativity, except in special cases. This is also not true. Most GR textbooks do not tackle the general formulation of energy conservation in GR. They just deal with special cases such as a static background gravitational field with a killing vector. This does not mean that energy conservation only works in special cases as some people claim. The textbooks just don’t cover the general case. Some textbooks do cover it but by using pseudotensor methods (e.g. Dirac, Weinberg, Landau & Lifshitz) A few textbooks do suggest that energy is not conserved, e.g. Peebles, but these are the minority. I am going to recount some of the history of the debate. To keep it orderly I’ll give it as a timeline of events with my own contribution immodestly tacked on the end. We start in 1915 with conservation of energy a well established concept recently unified with the conservation of mass by Einstein. The World is at war and Einstein is about to publish his general theory. July 1915: Einstein lectures on his incomplete theory of general relativity to Hilbert, Klein and possible Noether at Göttingen, convincing them that his ideas are important. October 1915: Albert Einstein publishes a tentative equation for general relativity with being the Ricci curvature tensor and being the covariant generalization of the energy-momentum tensor. November 1915: Einstein realises that his previous equation cannot be right because the divergence of the energy momentum tensor is zero as required by local energy conservation. To correct it he writes the new equation . These are the Einstein Field equations which work because the left hand side has zero divergence due to the Bianchi identities. November 1915: David Hilbert publishes a calculation showing how the Einstein Field Equations can be derived from a least action principle. In fact his work is dated prior to Einstein’s but they had been in communication and it is reasonable to give the priority for the equations to Einstein and for the action formulation to Hilbert. 1916: Hilbert publishes a note with an equation for a conserved energy vector in general relativity. 1916: Einstein publishes a full formulation of energy conservation in general relativity in which a pseudotensor quantity is added to the energy-momentum tensor and another superpotential term to give a conserved energy current. 1916: Einstein predicts the existence of gravitational waves which will carry away energy and momentum from orbiting stars. He derives the quadrupole radiation formula to quantify the rate at which energy is dispersed. July 1917: Oscar Klein points out (with help from Noether) that conservation of Hilbert’s energy vector is an identity that does not require the field equation. 1917: In response to Klein, Hilbert publishes an article questioning the validity of energy conservation in general relativity. He says that the energy equations do not exist at all and this is a general characteristic of the theory. 1917: Writing to Klein, Hilbert says that general relativity has only improper energy theorems. By this he means that the pseudotensor methods are not covariant. 1917: Klein writes to Einstein making the claim that energy conservation in general relativity is an identity. This is based on Hilbert’s energy vector. 1917: To construct a static cosmological model Einstein introduced the cosmological constant as an extra term in his field equations. March 1918: Einstein writes back to Klein explaining that in his formulation of energy conservation the divergence of the current is not an identity because it requires the field equations. 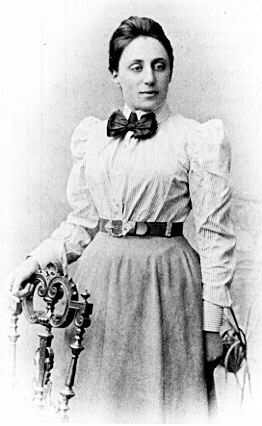 July 1918: Emmy Noether publishes two theorems on symmetry in physics. The first showed that symmetry in any theory derived from an action principle implies a conservation law. In particular, energy conservation is implied by time invariance. The second shows that in the case of gauge theories with local symmetry such as general relativity, there are divergence identities such as the Bianchi Identities. 1918: Felix Klein uses Noether’s theorems to derive a third boundary theorem to show why the conservation law of energy in general relativity must take a particular form that he considers to make it an identity. 1918: Einstein comments on the power and generality of Noether’s theorems but does not accept the conclusion that energy conservation is an identity. 1919: Arthur Eddington measures the deflection of starlight by the Sun during a solar eclipse. The observation confirms the prediction of general relativity and provides massive press publicity for the theory. 1922: Arthur Eddington expresses skepticism about the existence of gravitational waves saying that they “travel at the speed of thought”. 1922: Friedman finds cosmological solutions of general relativity that describe an expanding universe. 1929: Edwin Hubble observes the expanding universe in galactic redshifts. This led to Einstein dropping his cosmological constant. 1936: After working on exact solutions for gravitational waves with Rosen, Einstein concludes that gravitational waves can not exist, reversing his 1916 prediction. This sparked a vigorous twenty year debate over the reality of gravitational waves. 1936: After working with Robertson, Einstein eventually concedes that gravitational waves do exist. Rosen who had departed for the Soviet Union did not accept this concession. He never changed his mind even as late as 1970. 1951: Landau and Lifshitz publish “The Classical Theory of Fields” as part of a series of textbooks on theoretical physics. It deals with energy and momentum in general relativity using a symmetric pseudotensor. The symmetry means that they can also show conservation of angular momentum using the same structure. 1955: Rosen computes the energy in exact gravitational wave solutions using pseudotensors and finds the result ot be zero. He presents this as evidence that gravitational waves are not real. 1957: Herman Bondi introduced a formalism now known as Bondi Energy to study energy in general relativity and gravitational waves in particular. This work was very influential and formed a turning point in the understanding of gravitational waves and energy in general realtivity. 1957: Weber and Wheeler find a gravitational wave solution that does transmit energy. 1957: Richard Feynman describes the sticky-bead thought experiment to show that gravitational waves are real. The idea was popularised by Herman Bondi and finally led to the general acceptance of the reality of gravitational waves. 1959: Andrzej Trautman gave the formulation of energy conservation for the special case where a static background is given by the existence of a killing vector field. 1959: Komar defined a superpotential for general cases whose divergence vanishes as an identity. The superpotential uses an auxiliary vector field similar to the killing vector field in Trautmans theory, but the Komar field does not need to satisfy any special conditions so the solution is more general. The Komar potential has the advantage over pseudotensor methods that it is expressed in a covariant form. However, the zero divergence of the superpotential is an identity. 1961: In his book “Geometrodynamics” Archibald Wheeler says that energy conservation in a closed universe reduces to a trivial 0 = 0 equation. 1964: Weber begins experiments to try to detect gravitational waves. 1974: The discovery of the Hulse-Taylor binary pulsar shows that gravitational energy is radiated as originally predicted by Einstein. 1975: In his concise introductory text to general relativity Dirac derives a pseudotensor using Noether’s theorem to prove energy and momentum conservation. 1997: Philip Gibbs shows that if Noether’s theorem is generalised to include second derivatives of the fields and is applied to the symmetries generated by a vector field, a conserved current with a covariant current can be derived. The current which has an explicit dependence on the vector field is equal to a term that is zero when the Einstein Field Equations are satisfied, plus the Komar superpotential. For further historical details and references on the Klein-Hilbert-Einstein-Noether debate see “A note on General Relativity, Energy Conservation and Noether’s Theorems” by Katherine Brading in “The Universe of General Relativity” ed A.J. Fox, J. Eisenstaedt. Judging by the comments on the previous article I have not yet succeeded in convincing anyone that energy is conserved. Luboš Motl has posted a response contradicting my viewpoint and agreeing with an older blog post by Sean Carroll. Fortunately I have an advantage, I’ve done the maths and the outcome is clear and unambiguous. Since my detractors are people who understand equations I should have no trouble convincing them if I take a more technical approach. So, no more analogies, let’s start with Einstein’s equation. is the Ricci curvature tensor, is the metric tensor, is the cosmological constant, is a gravitational coupling constant and is the energy-stress tensor for matter. Since the current is divergenceless it defines a conserved energy. Some people claim that this result is trivial. Clearly it is not because it requires the gravitational field equations to prove conservation of energy. You should not make the mistake of defining energy as just the Komar superpotential, even though it is equal to that when the dynamics are taken into account. Energy must be defined as a sum over contributions from each field including the gravitational field, and dark energy. The energy contribution from matter is a sum of contributions from each type of matter field. It includes all the non-gravitational forms of energy including heat, electrical energy, rest mass equivalent of energy, radiation etc. This form of the law of energy conservation in general relativity tells us that the energy from all these contributions plus the gravitational contribution and the dark energy contribution is conserved. In other words energy can be transformed from one form to another but is never created or destroyed. There is nothing approximate, trivial or ambiguous about this result. It is energy conservation in the same old form that we have always known it but with the contribution from gravity included. You are currently browsing the archives for the Energy Conservation category.